As if I didn't love Jerusalem: A Cookbook already so much, but I fell in love with it even deeper...I will explain in a second. I have been obsessed with these cookies, or at least the commercially made version in Israel by Abadi. When I get to the Kosher Market in MD, I seek out a bag, usually sitting at a bottom shelf hidden in the shadows and dark. I would cruise up and down the aisles, with a rickety cart, I always fall on one, until I find them in the somewhat disorganized market shelves. Though I must say the owner is real nice. The minute I upload my groceries into the trunk of my car, I fetch the Abadi cookie bag, and rip through it, to munch on a few more than necessary cookies, while I drive. It's a predictable scene, without fail, every single time. Problem was, I knew my Tunisian, Algerian and Moroccan friends make similar versions, so what is the cookie's origin? Abadi sounded Iraqi to me, but turns out he isn't, his ancestors are from Aleppo, Syria, but how did I find that out? In my frustration of researching the origin of this cookie, I turned to Twitter and tweeted @Ottolenghi and @SamiTamimi, the authors of Jerusalem, last night. This morning I woke up to an answer. That's the beauty of the London-DC time lapse. All along it was right in front of me, if only I would have turned to the page before the recipe. It's a fascinating read on pages 267-8 about the cookie and through and through. Coincidentally, like Ottolenghi and Tamimi, I was also born in Jerusalem but I don't have an affinity to the city as they do, We move to the coast shortly after I was born. I am more of a tourist, revere Jerusalem, the city, from afar and when I visit the holy city. On to the recipe, Ottolenghi and Tamimi say the Syrian version here is the most flavorful out of all the other versions. I wished to replicate the Abadi version. Am not sure if the ingredient list on the bag has cumin listed or not, but I didn't use it. I listed it as optional. I mixed 1 tablespoon of white sesame seeds in half the batch. In the other half, I mixed in 1/2 the fennel seeds from amount stated in the recipe. When I mix in the fennel seeds, I do not sprinkle sesame seeds on top. I only sprinkle, either white or black, sesame seeds when I use sesame seeds in the dough. These cookies are best the day of. They resemble Abadi's in flavor but not in texture. They have some crumble to the edges the day of, but lose the crumble the next day. 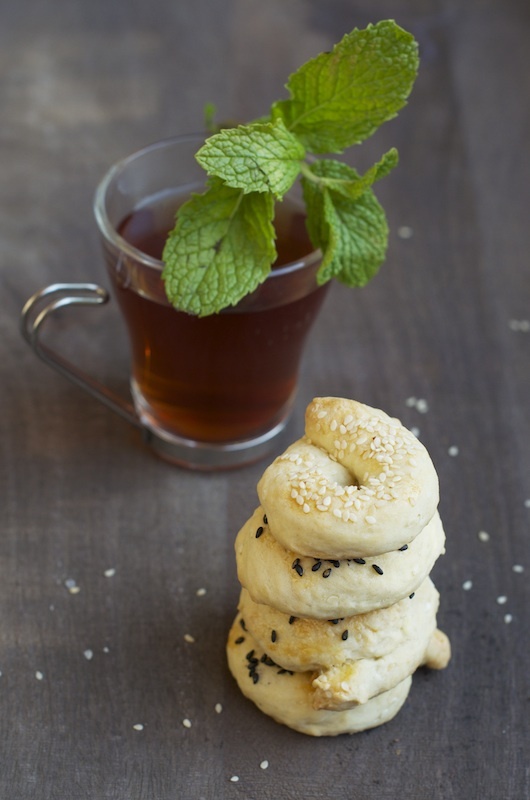 You can be playful, you can sprinkle the cookies with a mix of both black and white sesame seeds. When I make the next batch I will try to sprinkle some with zaatar. Am curious how it will turn out. In the book they also brilliantly suggest to serve these addictive, crumbly cookies at cocktail parties or as an appetizer with a tahini and yogurt herb dip. I simply like my savory cookies along with tea, but I will definitely make the dip for one of my Chanukah parties or bring it to a Christmas party during the season. This book has been sent to me as a review copy, as I mentioned in my Burnt Eggplant with Garlic Lemon and Pomegranate Seeds post, but I've been obsessed with it for months before it arrived. When I received it, I felt like I hit the lottery. The little pleasures that make me so happy! In a large bowl add the flour, salt, sugar, yeast, baking powder and sesame seeds or fennel seeds and mix. Make a well in the middle of the flour and into the well add the oil and butter. Gradually add the water and mix until a dough forms. Knead for a couple of minutes. Line 2 cookies sheets with parchment paper. Form 1oz dough balls into a 3/8inch thick, 5-5 1/2 inch long ropes. Form each rope into a ring and line on a parchment paper lined cookies sheet, approximately 3/4 inch apart. Instructions in the book say to let cookies at this point proof for 30 minutes. I didn't. I proceeded directly to bake them. Brush the cookies with the whisked egg and sprinkle the sesame cookie dough only, with either black or white, or both, sesame seeds. Bake for 22-25 minutes (ovens vary, took me 25min) until lightly golden on top. 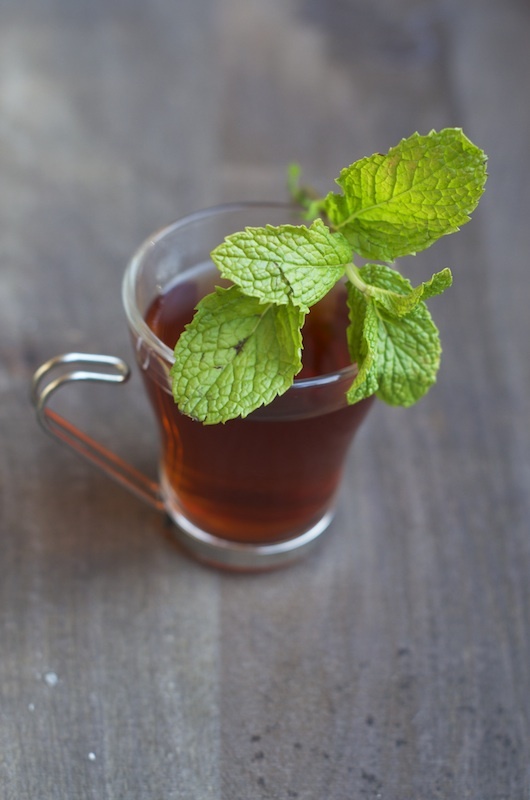 Let completely cool at room temperature and store in an air tight container for up to 10 days. Blitz all dipping sauce ingredients in a food processor until uniformly colored and smooth. Add 1 tablespoon of water if sauce is too thick and refrigerate before serving. Interesting cookies! I bet they taste wonderful. A book I have added to my wish list. 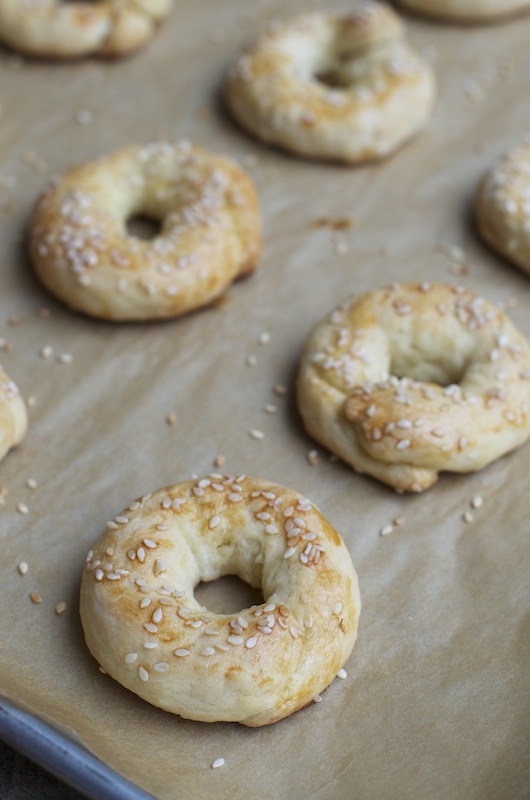 Love cookies baked with yeast..these look so light.And like the yogurt dip with Tahini.. I love the idea of this completely! What a unique cookie to chomp on...I bet Santa would be very pleasantly surprised! Beautiful cookies, I love the idea of a savory bite! I´m madly in love with Plenty, so I understand your obsession with Jerusalem. Aren´t those cookies lovely! I love sesame in crackers, and the yeast is very interesting. Just wonderful Shulie! My mother and grandmother always made Ka’ach…our recipe is more of a sweet bread….I make them quite often and now my daughter makes them for her kids! Your cookies look lovely and I would love to try this recipe! I would also love to check out that book! Nicely done!! Sounds like the Moroccan version. Sweeter with fennel seeds. What is the country of origin of your grandmother's recipe? Does it have fennel in it? Thank you so much. Your family's Lebanese version looks fantastic. Thanks for sharing Kathy. For those of you who do not know what Mahlab ishttp://en.wikipedia.org/wiki/Mahlab It's aspice made from grounding the stones of St. Lucie's cherries. We all love here Abadi cookies :) :) and your cookies are looking wonderful, and I just have to try the dip! Sure. Of course. Always like to see variations. Ottolenghi & Tamimi's is pretty close without the cumin. Of course the crumb was softer and not hard, since it is fresh and home-made. :) Could you copy and paste link here so readers can have it too? Thanks Winnie! Thank you so much everyone. Up top Kathy shared a sweet version to this cookie. Her family's heirloom recipe from Lebanon. I love the Plenty book and can't wait to see the Jerusalem one. 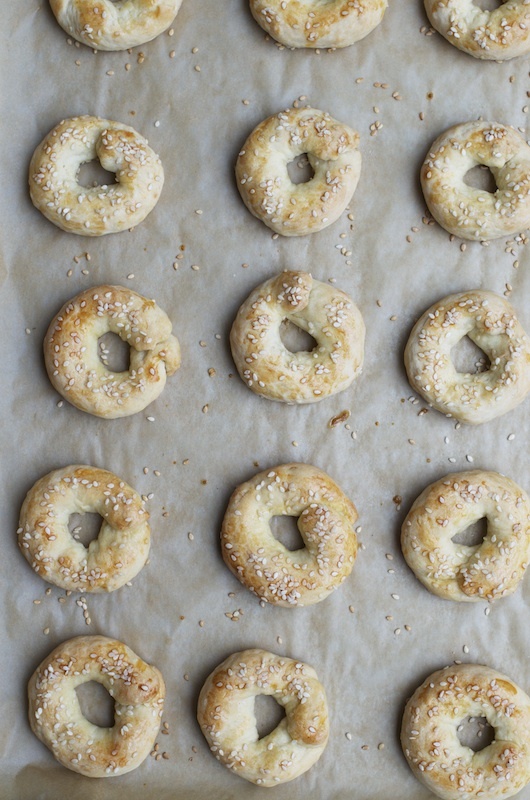 You know in Sicily there are very similar cookies (w/fennel and sesame seeds). Sicily has many dishes that are from their Middle Eastern roots. I've had them before in Sicily baked by my aunts and I would love a taste of yours-delicious! Ooh I didn't know Sicilians have a similar recipe. Do you have a recipe? Or can you link to one? This is a Moroccan sweet version shared by the cookbook author Paula Wolfert http://moroccancuisinemarocaine.blogspot.co.uk/2012/08/oujda-wajda-kaak-moroccan-sunny-shaped.html You can join the Moroccan cooking group on FB led by Paula if you are interested in the cuisine. Scrumptious, Shulie! These Mediterranean flavors satisfy deeply enough to be a full-fledged snacking experience or a great addition to any lunch. Fennel is irresistible! I know... I know... this book is freakin' amazing. And, sadly, I've yet to cook from it. That's changing immediately. I am just absolutely in love with the look of these cookies. I bet the fennel is lovely. Hi Kate, do you have a link to the recipe you use & is its origin Turkish? Good tidbit of history there. Very curious! Loved learning about the origins of these savory treats. They look absolutely delicious, and I imagine perfect for an afternoon snack with a cup of tea! The cookies sound really good. As does the cookbook. Thanks for sharing! Happy Fennel Friday! We love this recipe and it is featured on our Fennel Appetizers Recipe Round-Up this week! THANK YOU! Subscribing to your blog stat....gorgeous culinary artistry...and THESE...so evocative of my time in Tunisia...Could my black nigella seeds be used in this in any manner?....I feel I have truly "scored" by happening upon your fine writing, formating, well-explained and beautiful recipes. MasterChef score.